Yesterday was the FIRST day of Spring, which means it’s time to roll up those sleeves and do some spring cleaning. Really, most of what I classify as spring cleaning is just as much organizing – sure it’s great to dust and scrub and mop, but it’s equally great when everything is finally in its place. To help motivate those in your household, or even just a friend that needs a boost, I’ve rounded up five nifty ideas to help you get your home in order. I don’t know about you, but every time I walk past the mess of cords behind our TV unit or under our computer desk, I get a little tense. While I’d like to believe my fiancé knows what all goes where, it might be nice to have everything clearly marked in case one day I have the unenviable task of plugging or unplugging some pieces. These cute, reusable clips from Umbra make electrical cord organization super easy. Use the enclosed white-erase marker to jot down each cord’s use, and simply erase whenever you replace a product or move something around. While you’re at it, invest in an energy-saving power bar to maximize your productive vibes. Makes a great gift for a techy dad. For whatever reason, I have an abundance of lip products. And yet, I often lose track of the slippery little buggers, when in fact I’d probably wear lipstick a heck of a lot more if it were perched on my counter, looking like a beauty store display. It’s so incredibly easy and affordable to add little touches like this to your dresser, bathroom counter, or vanity table – you’ll not only have something that looks great, but encourages you to actually use your precious products. After all, a candy-coloured rack full of lipstick is simply too enticing not to take for a spin. If you’ve got kids in the house, inevitably you’ve also got sporting equipment. Whether they’re squeezing in extra practice between little league matches or simply have a football or basketball kicking around for impromptu pick-up games, those pesky (yet important) pieces of equipment can be a pain to store. This nylon case is genius on multiple levels. For one thing, it’s on castors, making it easy to move around. For another, the multiple compartments gives you flexible storage options – maybe each kid is responsible for one bucket, or you can keep everything together by sport of by function. No matter what, this is an extremely functional solution for your garage or storage room to keep yourself from tripping over an errant soccer ball. I just cleaned up my perpetually cluttered desk at the office the other day and man was it easy. Annoyingly so really – I could have been sitting in a far less scattered, messy space had I just taken an hour to tidy up at some point. Or alternatively, if had some better organizational tools at my fingertips. Enter the Snap It Up Desk Organizer – a rainbow-hued acrylic board that takes up marginal space and can stash layers of items on a temporary (or long-term) basis with its colourful oversized rubber bands. Slip that super important client’s business card in there, or the list of numbers you most frequently call, or even stamps so you can grab one in a flash. Looks great, works great, tis a great choice for a cluttered coworker’s desk. If you’re like me, wardrobe space is at a premium – which often means shuffling out heavy sweaters, knit dresses, and wool pants come warmer weather. 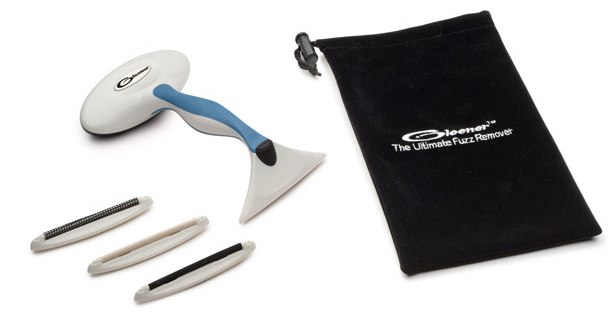 Before you pack all those precious winterwear items away (or have a wardrobe purge of items that have gotten pilled with frequent use), grab a hold of this amazingly handy gadget called Gleener. With three fuzz-removing blades depending on what type of fabric you’re angling to fix, this manual tool is a snap to use – just attach the appropriate head and brush it over your worn-in knitwear for astonishing, fabric-renewing results. Trust me when I say your future self in the fall will very much thank you when they go to put on that delicate sweater on the first chilly day of the season. Three quick bonuses on this product, are you ready? First, it’s made by a Canadian company (yay!) Second, it comes with its own handy storage case so cleaning up one mess doesn’t cause another. Three, it’s under $20 (and it works) – making it a fantastic gift for your clotheshorse sister or even as a snappy Mother’s Day present for the gal who has everything. 1) Leave a comment by April 5th with the home organization gift idea featured in this post you like the best + who you’d buy it for. 2) Entries are limited to one per person / per email address / per household (or more if you score bonus entries). A random draw will be conducted on or around April 6th to select the winners, who will have 48 hours to respond before another winner is chosen in their place. 4) Bonus Entry: Snaps up for subscribers: if you get a daily dose of the Canadian Gift Guide already, you’ll earn yourself a bonus entry in this giveaway. Just remind me that you’re a subscriber below so I can verify that’s the case if you win. And if you’re NOT a subscriber, I mean really, what are you waiting for? Use the ‘gift me please’ box on the righthand side to sign up. I like the Beautify Your Makeup Vanity. I don’t have many lip products, but my bff does, and she’d love it. I could use the Umbra talk bubble for cords – sorry, wouldn’t give them to anyone, I’d keep them for myself! This is a tough one! I’m in home organization mode lately and could use just about all of these! I’d probably say the sports organizer just because I can never have enough storage space! I’d keep it for myself to clear up all those balls and sticks my 3 year old has in every room of the house! I want that Sports Organizer for my grandkids – both of them are heavily involved in sports and this would help organize their equipment. Love the Umbra talk bubbles for cords but I also love the Gleener which would replace the clothes shaver which tends to cut little holes into fabric if you aren’t careful. Talk Bubble Cord – $8 for 3 @ Umbra – I would gift these to everyone I know, so practical! Already a happy subscriber. Merci! I have a plethora of sweaters that I could easily Gleen – so could the rest of the family! I’d buy the Sports Organizer as a gift for daughter to help with my grandsons’ sports equipment. I would choose Sports Organizer – from Bed, Bath & Beyond for sure. I’d buy it for our garage! We totally need to do some organizing in there!! I love the Sports Organizer and would purchase it for my boyfriend. I could use the snap it up organizer! I love the Beautify your Makeup Vanity. I have way to lipsticks and can never find the color Im looking for! This would make my life so much easier. I subscribe to the Canadian Living Guide and I have to tell you that I thoroughly enjoy reading it! I always learn something new and see some great new products. Keep up the good work! I’d get the Sports Organizer for my hubby to store his sports equipment. I like the sports organizer…I can see this coming in handy! I like the lipstick organizer — I could probably use it for papercrafting storage too (eyelets, brads, pearls, etc.) I definitely have a large sweater collection and am a current subscriber. The Gleener is something I need and would use. I’m known for leaving the house in ratty looking sweaters. I would love to have the talk bubble cord. I have a million cords for games systems, computers, printers, cell phones and a everything else and it would be nice to know which cord belongs to what electronic. I would buy the Gleener and would give it to my daughter as she has so many sweaters. I love the Gleener. This would be great for my sister and friends. I really like the idea of the lipstick organizer. Mine are in a bug jumble in my drawer. Snap It Up Desk Organizer – I would love to get this for my daughter to help organize her desk area. 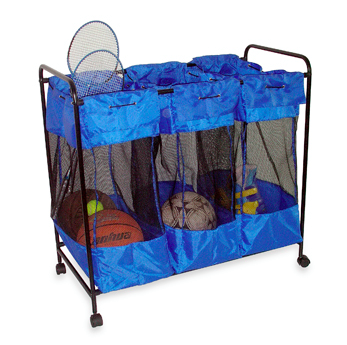 I love the Sports Organizer and I would buy it for my kids to put their basketballs in. I love the sports organizer. Looks awesome for the kids stuff… I would love it for ourselves! I really could use a gleener. They are great! I think the talk bubble cords are great too. I have been a long time subscriber to the Canadian Gift Guide. Love the Gleener! I had a similar gadget and gave it to my mom who has even more sweaters than I do, so this would be so welcome. Oh! When I saw the desk organizer I thought of my husband right away! The time I spend looking for something on his desk that he can’t find!!!! I don’t even want to go there. Now, the gleener – I just got a great deal on a CASHMERE top. But I guess part of the great deal was that it kind of pills a lot 😦 so could I use a gleener ??? Hey Pam – the Gleener is safe to use on cashmere! Definitely worth the investment for that reason alone. I like the talk bubble cord and I would buy it for my son. 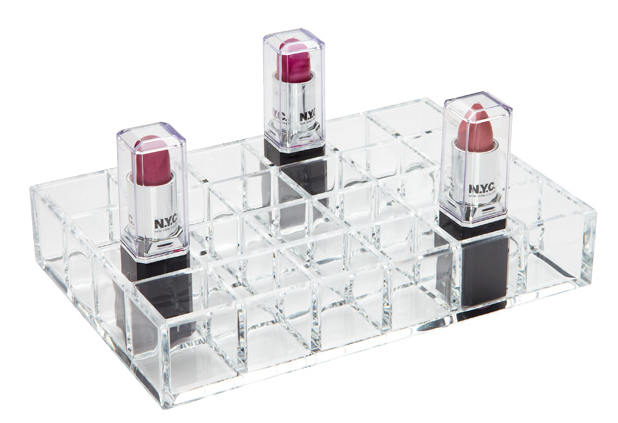 I like the Beautify Your Makeup Vanity: 24-Lipstick Acrylic Organizer and would get it for my mom. The home organization gift idea featured in this post I like the best is the “Energize Your Entertainment Unit: Talk Bubble Cord – $8 for 3 @ Umbra” & I’d buy it for my computer geeky friends who have more cables going every which way that I always manage to trip over one of them. I have no idea how they vacuum! Bonus entry: I’m a subscriber but I don’t receive a daily dose of the Canadian Gift Guide. Instead it’s a weekly roundup. Did I sign up for the wrong one? Hmm strange Alison – I’ve never heard of someone getting weekly subscriptions! Maybe check at the bottom of your next email to see if there’s a way to change the frequency of your emails. I’d like the lipstick organizer for myself. I want the Gleener; it would make a great Mother’s Day gift. I love the Talk Bubble Cord Clips. I’d give these to my husband. It’s the Gleener that caught my eye and my interest. Sounds like the perfect thing for me and my pullovers. The sports organizer for sure, and I would give it to my husband and two boys! Love the sports organizer but we wouldn’t use it for sports equipment. I need that Gleener! I have a wall of shirts, as well as a wall of sweaters, hoodies, and cardigans that could benefit from such a cool little device! Fingers crossed! I like the “Tidy Up Your Workspace: Snap It Up Desk Organizer – $17.99 @ Organize.com” the best and would buy it for myself. I am now a confirmed subscriber. Talk Bubble Cord – for my husband. I hate the mess of wires that hang from the entertainment center and every desk we own. Talk bubble cord for me as I need the cords labeled when I ever try to fix something! Some great items here sure to make spring greening a breeze. I’d buy the Sports Organizer for my husband — it’d be great in the garage.